In case you haven’t noticed, Polaris’ snowmobile marketers have taken dead-aim at Ski-Doo’s Number 1 sales status and are making a good case for improving the Polaris marketshare. With overwhelming sales success earned by the 2011 Polaris Pro RMK powder sleds and a seriously revamped Switchback line up for 2012, Polaris is letting the snow world know that this pioneer sled company is very serious about its snowmobile segment. It’s obvious that consumers and aftermarket vendors alike are paying attention to the Minnesota-based sled maker as we are seeing some excellent new aftermarket add-ons designed and engineered expressly for late model Polaris sleds. We offer a brief view of what’s available for you to add onto your Polaris before the snow returns. Aftermarket performance companies are offering more add-ons for the latest Polaris models. Polaris scored big with sales of its all-new, deep snow RMK models. But you can still find some products that will dress up that favorite powder ride and give yourself some personalized ergonomics. You’ll find Rox Speed FX offers patented handlebar risers and other ergonomic solutions for active powder players. This northern Minnesota based aftermarket firm offers unique handlebar risers that can be universally adapted to a variety of sleds. The company has designed and manufactured its innovative line of products since 1999. For this season, Rox adds a new height adjustable riser that adds 4-to-6-inches of rise. The Rox Height Adjustable Handlebar Risers adapt to any “T-stem” width allowing them to fit a variety of different brands and models of snowmobiles. The design is said to “…Take the guess work out of deciding how high you want your handlebars.” This product also lets you fit one sled to multiple riders as the handlebar height can be adjusted quickly for different conditions and riding techniques. Simply lower the product to accommodate “laid back” trail riding or kick them up a notch to better suit stand-up ditch banging and backcountry exploration. Plus, Rox’ new handlebars are easily lowered to fit your sled cover when trailering. The two adjustable heights range from 4-6 inches to 6 to 8-1/4-inches. 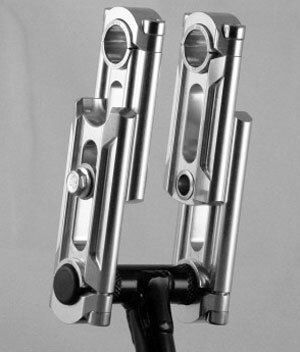 The Rox Elite Series risers feature a location locking adapter that allow you to clamp standard 7/8-in. or 1-1/8-in. taper bars. Starting at a suggested retail price of US$144.95, the handlebar accessory offers a premium anodized finish. Rox warns that you always check that you have adequate throttle and brake cable length before installing the add-on risers and especially before operating your sled. For more information about this product and other Rox Speed FX products, check out http://www.roxspeedfx.com/. 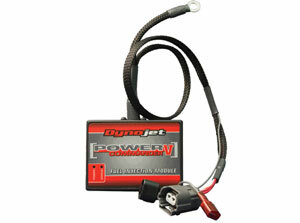 Select snowmobile aftermarket shops offer the Dynojet Power Commander V PC5, a fuel injection adjustment unit that plugs “inline” with the stock ECU (electronic control unit). Because the Power Commander is engineered to use original equipment style connectors, no splicing or cutting of the harness is required. Changes are made to the engine’s fuel and, in some cases, ignition curves via the Power Commander’s on-board microprocessor. This technology is said to offer a large area of adjustment without making any permanent changes to the ECU. Removing the Power Commander returns the engine to its previous stock condition. Each unit comes complete with software and cable link that allows you to change between different maps or make adjustments to a map file. However, Dynojet Research does not offer a supported Map Database for Snowmobile Power Commanders. Power Commanders for snowmobile applications give you the ability to fine-tune your fuel curve to coincide with your engine/exhaust setup. The Power Commander allows you to increase or decrease the amount of fuel up to +/- 100% from the stock fuel curve. Dynojet recommends using its Wide Band Commander to gather RPM, throttle position, and air/fuel ratio data. With this data you will be able to adjust the Power Commander accordingly to achieve the optimal settings for your snowmobile. The Power Commander is shipped from Dynojet with a “zero map” loaded into the unit. 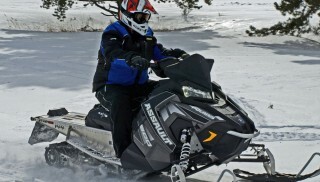 Installing the Power Commander in this form will not change the way your snowmobile runs. In order to achieve an increase in performance you will need to adjust the settings based on your Air/Fuel ratio data or by trial and error. Therefore, it is recommended that only advanced tuners use the product. There are various Power Commander units available including one for Polaris’ Cleanfire Injection system. Retail pricing starts around US$370. You can find information about this product at http://www.powercommander.com/ or also at Hot Seat Performance based in Forest Lake, MN (hotseatperformance.com). This Lynden, Washington-based aftermarket manufacturer has been building high quality products for off-road riders for 12 years including its own proprietary Holz Racing Products suspension and chassis components. 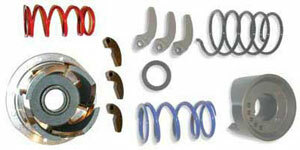 You’ll find a variety of Holz Racing Products parts and accessories to fit your Polaris. You boondocking type riders might want to consider the HRP IQ gas rack that is designed to fit the new Polaris RMK tunnel and accommodate a 2.5-gallon auxiliary fuel can. The lightweight rack is specially engineered as a seamless add-on for the 2011 Polaris Pro RMK and 2011 Switchback Assault. You’ll find more HRP products as you explore Holz Racing Products’ online catalog at http://www.holzracingproducts.com/. 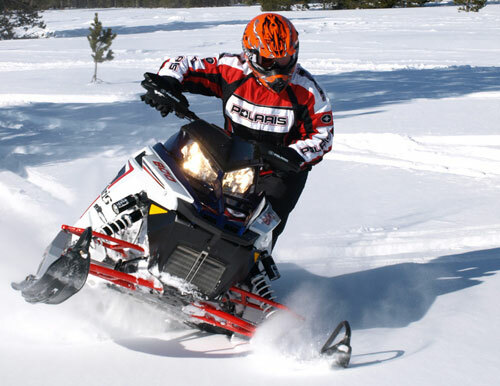 Goodwin Performance has been around the performance snowmobile industry for more than a quarter century and has spent the past 14 seasons developing products for the snowmobile market. In addition to offering a performance gain over stock, Goodwin Performance seeks to make its kits easy to install. The kit is said to provide improved acceleration as well as improved throttle response and backshifting. Depending on the specific model and year, each Polaris kit includes: balanced weights, Goodwin Performance primary and secondary spring, helix and belt deflection shims (some kits), a hardcoat progressive angle helix or Team helix, instructions and tuning information. Check the goodwinperformance.com website for specific kit pricing and other information. Suggested pricing starts around US$260.